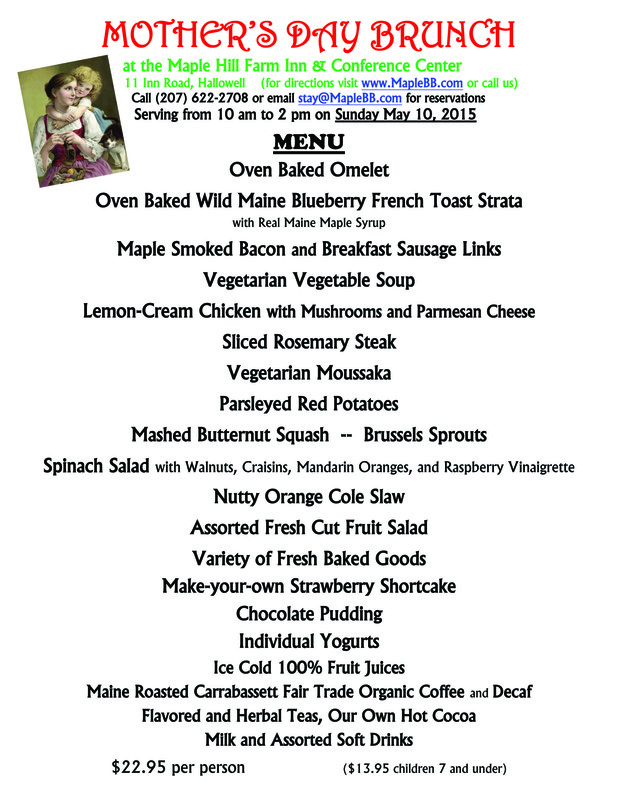 Sunday May 10, 2015: Our annual MOTHER'S DAY BRUNCH! We only do two public dining events a year, the other one being Easter Brunch, so call 207-622-2708 for reservations. Served from 10 am to 2 pm. Full Buffet for $22.95. Private tables, and large or small groups are welcome. Full liquor service is available. The full menu is below! Here is our 2015 menu as a Word document. Here is our 2015 menu as a pdf file. Innkeeper Scott Cowger will be riding his bicycle in his 31st consecutive Trek Across Maine in June 2015. He has set an ambitious goal of raising $5000 toward the American Lung Association in Maine, and if you'd like to contribute, please contact him at 207-622-2708 at Maple Hill Farm. 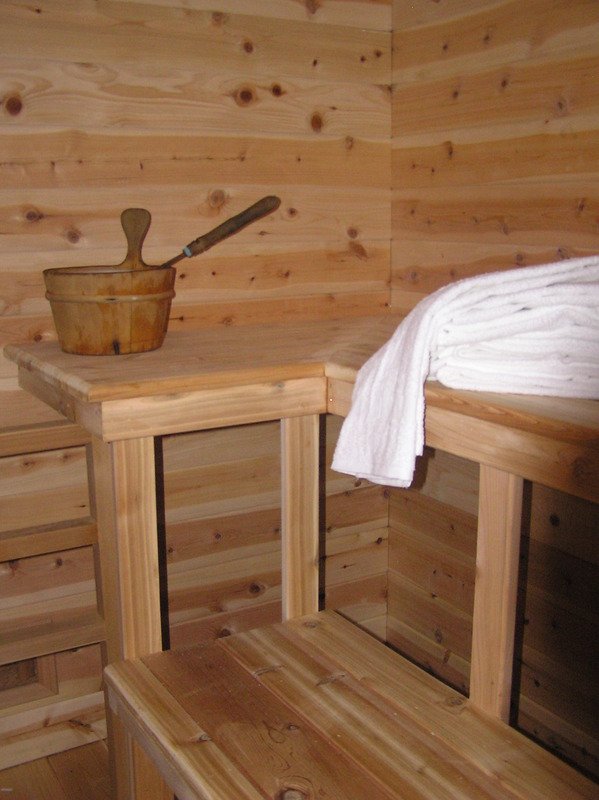 Lower mid-season rates are in effect, so come enjoy the outdoor hot tub & sauna as spring arrives in Maine! 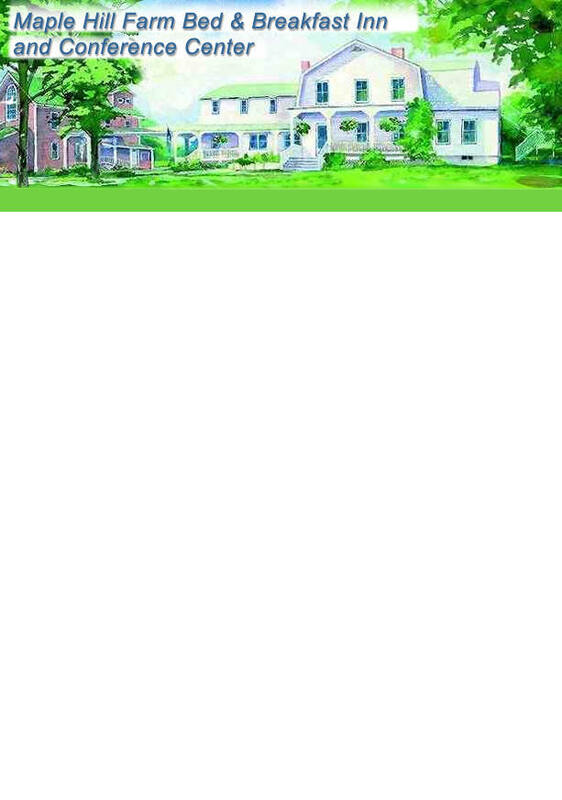 TOP QUALITY MAINE INN & BED AND BREAKFAST - why stay in a hotel when you can enjoy a country inn experience at the same or lower price! MAPLE HILL FARM INN AND CONFERENCE CENTER in Hallowell, Maine, just outside Augusta. 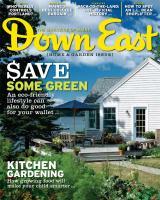 And we're "DEEP GREEN" with wind and solar power, plus many other green practices. 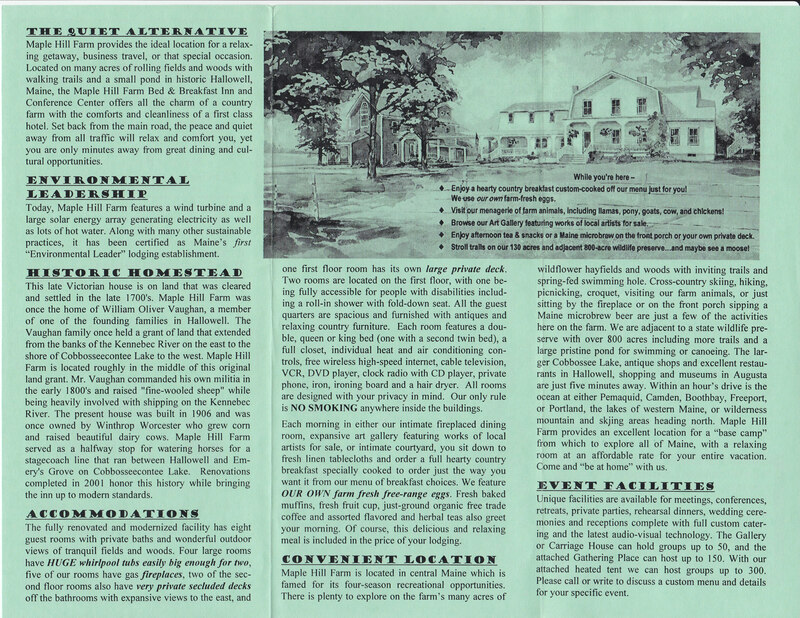 HERE is a full history of the inn. Here is our brochure: FRONT and BACK, and here are background sounds to enjoy while you read. 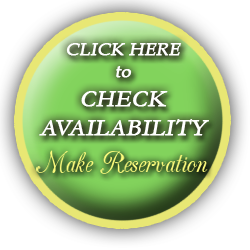 You can click THE GREEN CIRCLE above to check availability or make reservations, and we always welcome a personal phone call if you prefer. even If it says we have no availability for the type of room you are looking for, please call to see if we can work you in or at least put you on a waiting list. Please also click the green circle to check for any last minute specials we may have! Visit our Live front yard "Feeder-cam" HERE! and there's much more...keep scrolling! At this Augusta-area Maine bed & breakfast inn, you can enjoy all the features of a full-service hotel but at a place that "feels like home." Our guest rooms all have private baths, flat-screen cable television, and individually adjustable climate control. Wi-Fi is included and there is never an added cost for that. We have ample common areas, full bar service, and a common guest kitchen with baked goodies and 24/7 coffee/tea/cocoa. For a spa experience, enjoy our sauna and outdoor hot tub, or a HUGE double whirlpool (some call them jacuzzi) tub, fireplace, and private deck in your own guest room as part of your Maine vacation. When traveling to or through Augusta on your way to Bar Harbor or returning from Baxter State Park, treat yourself to a relaxing bed and breakfast stay in our green certified country lodging with solar and wind power. We specialize in the needs of business travelers and visitors to MaineGeneral Medical Center and the Togus V.A. hospital in nearby Augusta. AUGUSTA, MAINE (ME) area, in HALLOWELL: Serving the Augusta, Hallowell, Gardiner, Togus, Winthrop, Monmouth, Manchester, Belgrade Lakes, Farmingdale, Waterville, Readfield, Richmond and Windsor Maine areas as a relaxing accommodation alternative to Augusta and Waterville Maine area hotels and motels. Just 25 minute to the Togus V.A. Hospital. 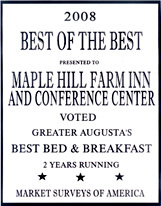 At this Award-Winning bed & breakfast inn located in Hallowell, Maine (next to Augusta Maine) we provide a unique combination of the peace and quiet of a country farm with the full services that today's travelers request, and all of this just minutes from the Maine State Capitol Building. Perfect as the quiet alternative for lodging for the business or vacation traveler to the Augusta Maine area. 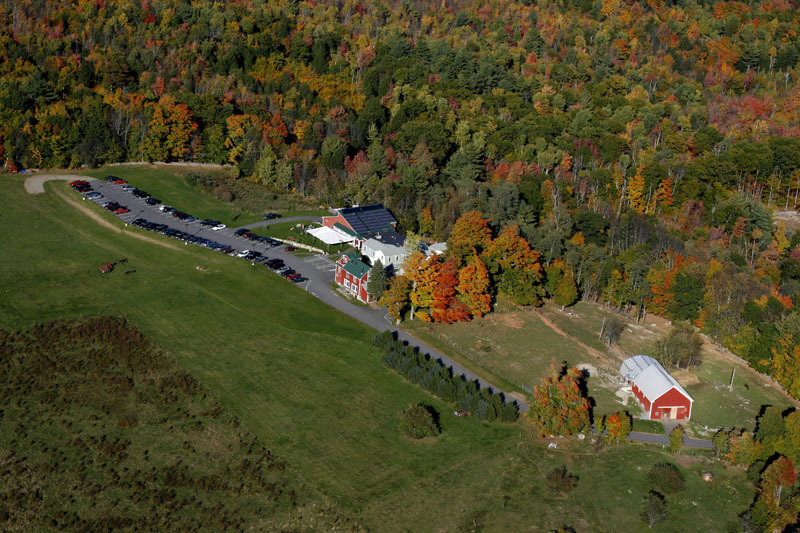 THE AERIAL VIEW ABOVE shows the entire facility at Maple Hill Farm, including our long driveway to bring you back from the road, The Gathering Place conference and event center, the intimate yet full-service 8 bedroom inn, and the barn full of animals down by the road. You get a glimpse of the 130 acres of rolling fields and woods with many trails (click here for a trail map), and our large parking lot for events. Maple Hill Farm B&B Inn rated "excellent" by 27 travelers on Tripadvisor, its top rating. Bed & Breakfast Guests have use of a common guest kitchenette with refrigerator, freezer, microwave, anytime coffee, tea, and cocoa, plus home-baked goodies. Be sure to check inside the refrigerator for some of Karan's homemade desserts! Full custom-cooked country breakfast from our menu is included each morning. 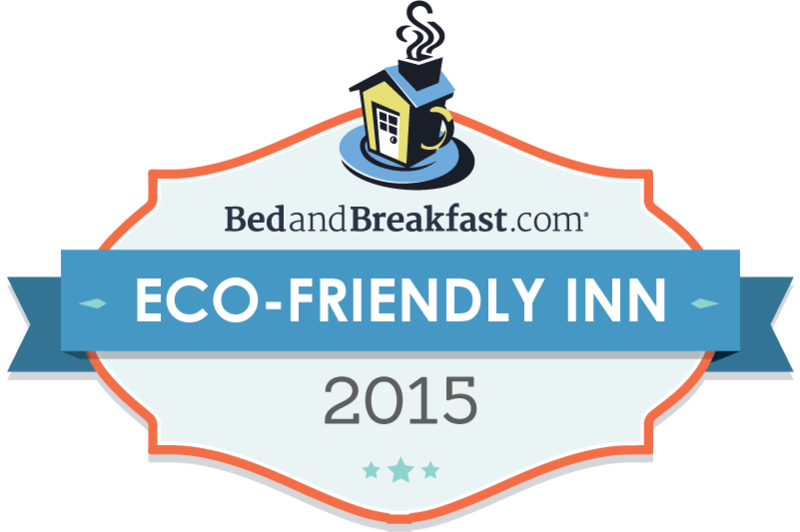 Served anytime from 7 to 9 a.m.
FREE Wireless High Speed Internet throughout the inn. 24-hour Guest Computer available in the Pub (Free boarding pass printing). Double Whirlpool Tubs in some rooms. Private Decks in some rooms. 24-hour coffee, tea, cocoa & home-baked goodies in the Guest Kitchen. If you don't want to venture out, we have frozen dinners and ice cream for sale in the Guest Kitchen, and a table to eat in the Pub. DVDs and Videotapes available to borrow (limited selection). Full Bar Service (Beer, wine, and cocktails featuring Maine microbrews and draft). Fitness facility located just across the road (Contact Age Right Fitness for more information). George and Linda Smith (the "Travelin' Mainers") write about us in a May 2012 article in the Kennebec Journal about Historic Hallowell. NECN television piece (April 2011) touting our environmental commitment from solar and wind power to farm fresh eggs and llama fiber! WGME-TV October 2010 segment on fall foliage and the tourism season in Maine featuring innkeeper Scott Cowger. 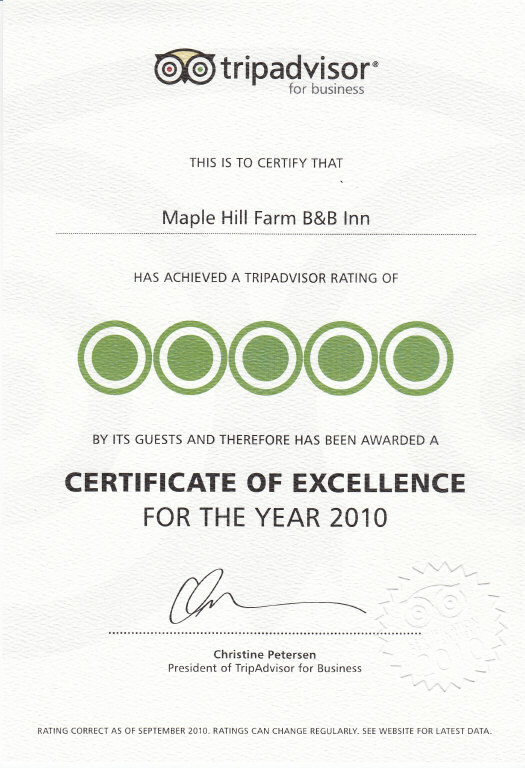 Maine's Times Record March 2010 article touting the state's Environmental Leader green lodging certification program and featuring Maple Hill Farm. Maine magazine's October 2009 issue features Maple Hill Farm as the start of a two-day tour of the western Maine foothills. Boston Globe article September 27, 2009 featuring our green energy practices, and referring to us a being "green long before it became a household word." 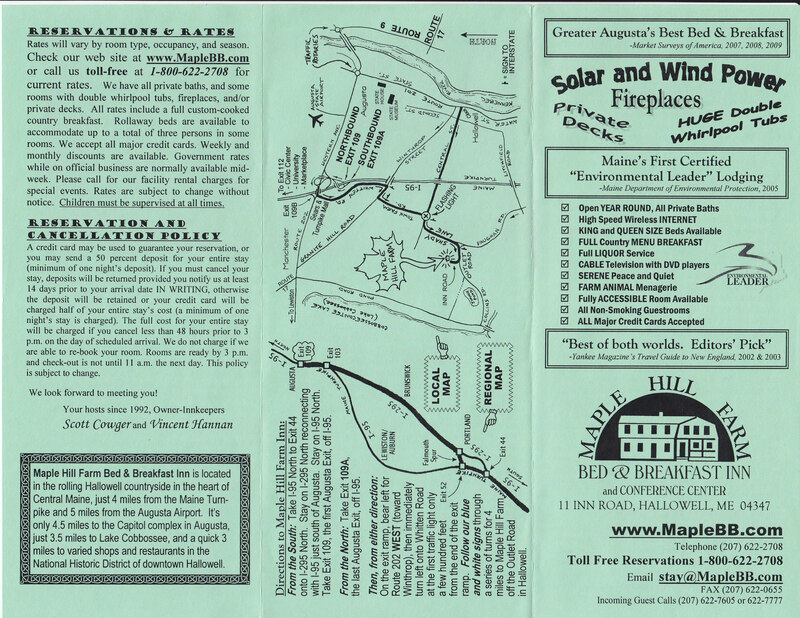 Maine Sunday Telegram article in the 2009 Fall Vacationland Guide detailing a foliage route with a side trip to Maple Hill Farm just to enjoy the "spectacular" views. Innkeeper Scott Cowger profiled in Kennebec Journal article regarding his 25th consecutive annual participation in the bicycle Trek Across Maine. Portland Press Herald front page article on April 20, 2009 featuring our alternative energy system and touting Maine's Environmental Leader green lodging certification program. "2006 -- Maple Hill Farm Bed & Breakfast Inn and Conference Center in Hallowell activates Maine’s largest solar array, a 202-tube solar water heater and fifteen-kilowatt solar electric panels, estimating the assembly will reduce its annual carbon dioxide emissions by forty thousand pounds; the Maine Department of Environmental Protection awards Maple Hill [Farm] its first Green Lodging Inn certification." 2008 Next List: Local Energy by Mainebiz - In the Sixth Annual Mainebiz Next List, ten people shaping the future of Maine's economy were selected by Mainebiz magazine and innkeeper Scott Cowger was one of them! 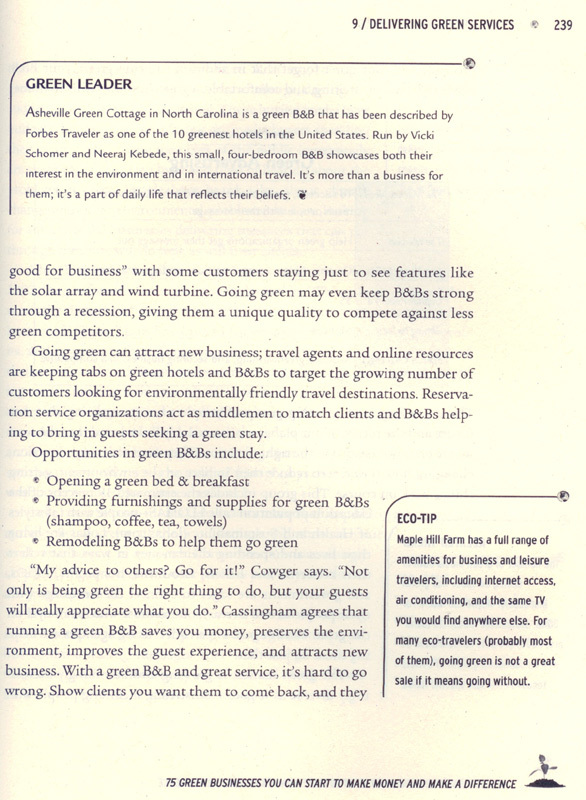 Featured in the New Book: 75 Green Businesses: You Can Start to Make Money and Make a Difference by Glenn Croston, Ph.D. - Maple Hill Farm is featured on pages 238 - 239. Here is our Press Release. View our written commitment to environmental excellence, and the steps we have taken thus far to implement this commitment at our Inn & Conference Center. 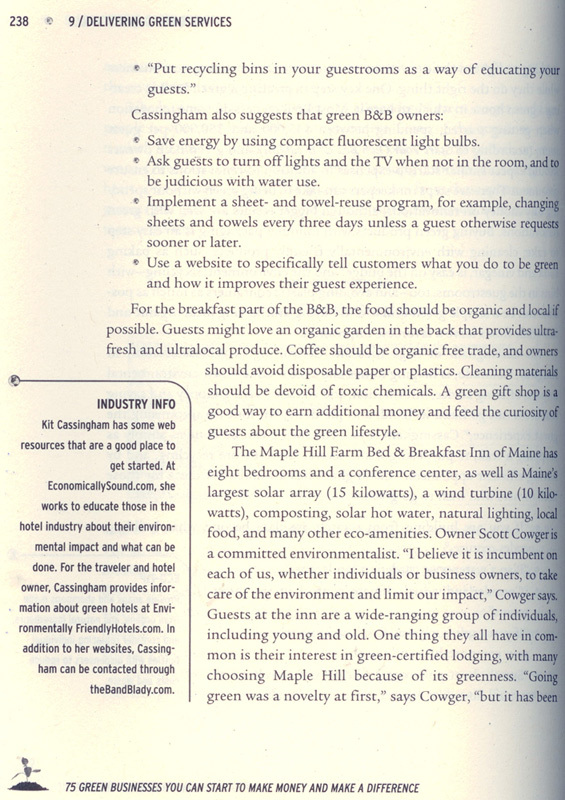 Conserving Maine's Environment, April 2008 - This article focuses on ways for businesses to become more environmentally-friendly, the way we have here at Maple Hill Farm. Now you can monitor how much energy we are saving and how much greenhouse gas we are keeping from the air on a daily, weekly, monthly and even yearly basis. Keep checking back to see how we are doing! If you are interested in using a gym facility, Age Right Fitness is located conveniently across the road. Rates for our guests are only $5.00 for each daily visit. They also have a 10-visit punch card special for only $30 -- without an expiration date. 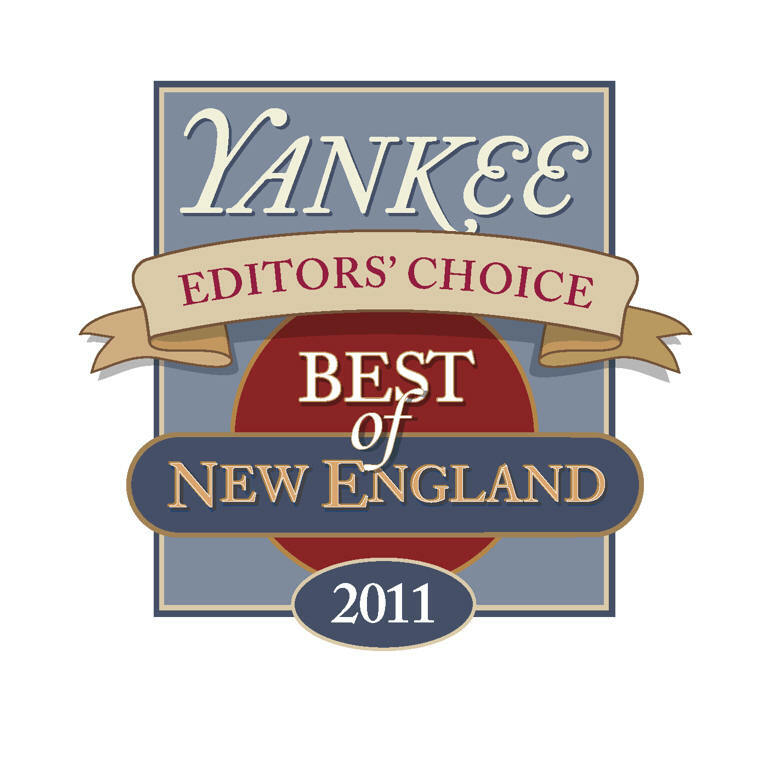 You can contact them directly at (207) 623-3550 or call us at the Inn if you have any questions. 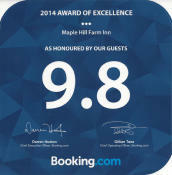 We have received this award for seven consecutive years since 2007! "One of 30 Great U.S. Inns." by contacting us directly at (800) 622-2708 or Clicking on the big green "Check Availability" circle.